Ideas are chaotic. You have them at different times, in different ways and with different granularity. Some are good, some are bad. Some are complicated, and some are simple. Some are bad, simple, anti-democratic, with no fundamentals, and can still get you elected in countries around the world. Therefore, how do you get a disorganized brainstorm, and transform it into a healthy, steady and sustainable product development flow? Well, each one of us can reach a different approach based on the circumstances of our teams. Here, I’ll present a model that we are currently using to try to organize the chaos. Maybe it can spark a change in your company! Before explaining the how, I wanna talk a bit about the why behind it. About the principles that I followed in order to build our own framework. Principle number one: don’t grow feelings towards your idea. I know, I know… it could solve the world’s poverty, it could make us billionaires, it could even cure cancer for God’s sakes! Well, it is, still, just an idea. It will, most likely, have flaws. Maybe the company is not ready for it yet — as in not having the right technology, nor enough money nor the right people to develop it. The fact is that the more mesmerized by an idea you are, the less is the probability of materializing it. Principle number two: question every single idea. If you have no strings attached, you’ll have to explain why you should do it. Separate the hypothesis from facts. Facts are immutable, while the hypothesis needs to be proven. Principle number three: don’t simply throw ideas away. Every idea is important. If it doesn’t get implemented now, document it in a tool where you can search for it later. And maintain a routine of checking all of the “lost ideas”… You might be able to implement it later, or it could trigger another idea. When I started thinking about organizing this chaos, I reviewed the concepts of Design Thinking, Upstream Kanban, Portfolio Management and others. And, as I always say, no one of those was the exact match that we needed (probably there never will be). Therefore, we built our own method. 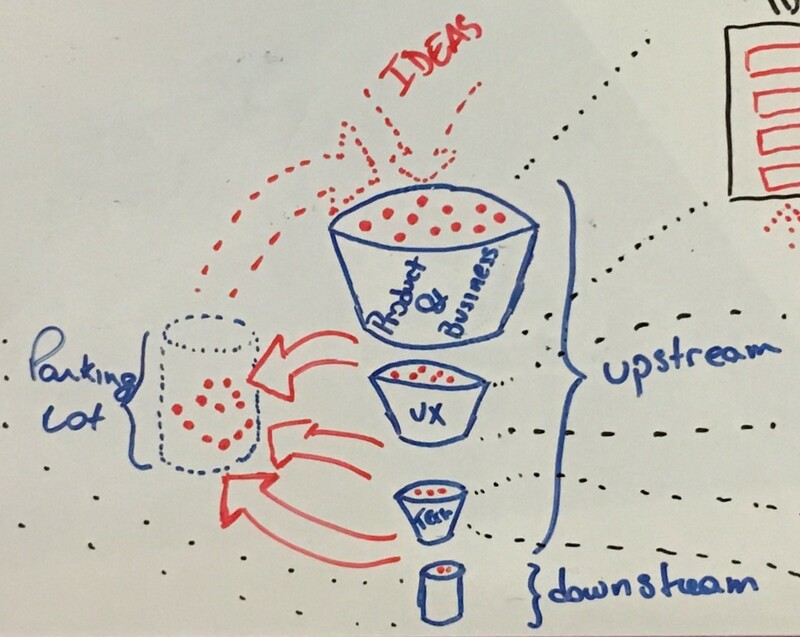 The Idea of this funnel is that all the ideas pass through it. However, the ones that are not relevant at the moment get stocked into a “parking lot” bucket, which may be used to refill the funnel in the future. Each funnel “slice” represents a different validation. The first is the business and product validation, in which we check if the idea has all the business needs and if it fits the products requirements and roadmap for the future. The second is the UX part. They examine what needs to be done, think about how that will be implemented in our product, build prototypes and test them with users. Lastly, there’s the Technology investigation and planning, in which they analyze how to create those functionalities, check if they are feasible, break the idea into epics and stories and roughly estimate the time it will take to finish them. Connected to the funnel, on the lower part, it is the delivery pipe (downstream). Whenever an idea gets to the tube’s beginning, it turns itself into a story or an epic, and we are committed to delivering it — aka there’s no turning back. That doesn’t mean we are not changing the scope or how we are doing it. It indicates we are bound to deliver the value (or the mission) we are supposed to. Ideas come from different places: product brainstorm, users demands, technology needs, top-down from the company board(let’s face it, we all have those sacred cows), etc. Another way of getting them into the funnel is to recycle an idea from the parking lot. Those will probably go a lot faster through the flow since it probably already has some documentation. When the idea enters this slice, it goes to a kanban board with some steps. The steps that we have here may vary depending on the demand’s nature. Here, we set an example with a Business Model Canvas construction (which gives you answers such as why you should build your idea), a business flow, or user journey, and the validation with the users and/or stakeholders. This part is similar to a design thinking sprint. The plan is to fastly test hypothesis with users, analyze our idea feasibility and build prototypes and wireframes. It is not a design phase; it is a deep dive into the customer journey, and how to solve the problems we wanna solve. Here, your tech team will fully engage. We recommend your company tech leads participate in all the steps of this phase. They will analyze each idea’s complexity and uncertainty, build the story/epic map so we can have a better understanding of the scope and divide the demands into different groups that will be combined into an MVP and a roadmap. The parking lot is where all the ideas that weren’t “approved” in a flow end up. They could have stopped after a business analysis or a tech unfeasibility. But, whenever it stops, it will already be documented and ready for a future restart. In this phase, you’ll face the old agile boards and post-its type of flow. You can use whatever method you prefer (Scrum, Kanban, Scrumban, Waterfall). The only idea is that, from here on, you have a commitment. You already proofed all the hypothesis from your demand. If it reached that place, it needs to go through it. That doesn’t mean things can’t change, as a former Agile Coach, I would never say that. But you are now dedicated to making it work. I’ll be very succinct with this topic since I think everyone should choose their own tools, to see what is the best fit. For the funnel part, we use three different Trello boards, one for each slice of it. Trello works really well here since you can easily move the cards, you can add all the documentation in one place and can transfer cards from board to board. It does what needs to be done. 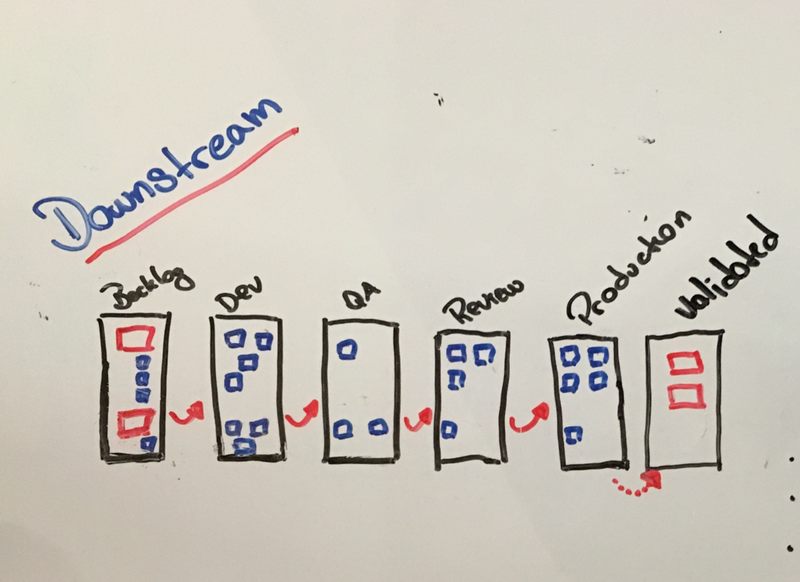 For the development stream, we use Jira. I’m not Atlassian’s number one fans (I still haven’t found a person that is), but it does the job and it integrates really well with their other products such as bitbucket and confluence. 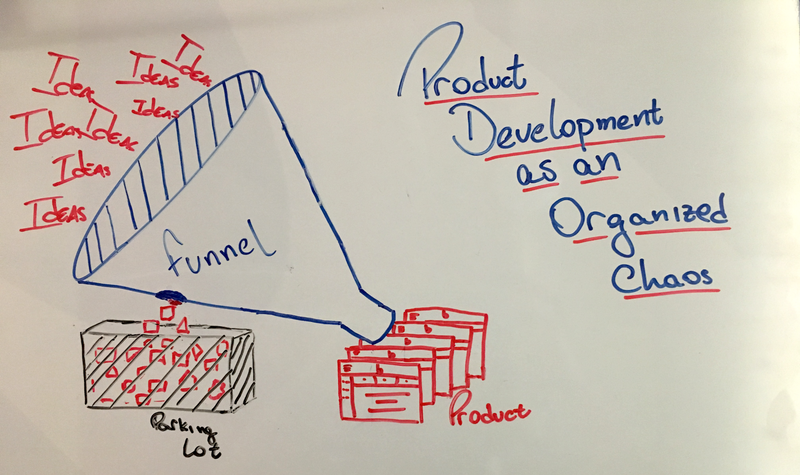 The funnel seems big, but it needs to be fast. That means having an upstream lead time of about 1 to 2 weeks max. Another critical thing to notice is that, even though each slice has the name of an area in the company, it doesn’t mean they are the only ones that will work in each one. Everyone works in every process step, but each area has the ownership of one of the slices. So, what about starting organizing your chaos today? Thanks to Igor Ribeiro Sucupira.